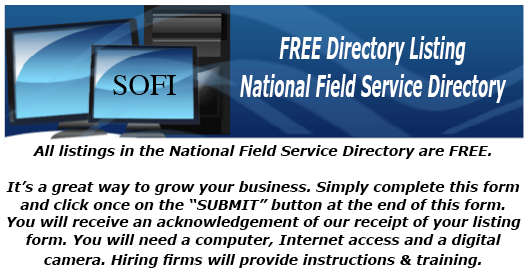 Please use this form to add or update your listing in the National Field Service Directory. Please insure that you check your spelling of words and apply good grammar. Do not use all small letters or all capital letters. Proof your input before you hit the submit button. We will not process your listing if it is filled with misspelled words or bad grammar. Your input says a lot about you. Be sure to make a good first impression. Fax number: Most firms do not require a FAX as work is usually received by email or as a download. Reports are usually sent by email or completed at a website. Enter 0 if you have no field service experience. SOFI will make no experience entry in your Directory listing if you have no experience.